Every day we rely on devices—cell phones and computers, for example—that require space on the radio frequency spectrum to carry electrical signals. But the spectrum is running out of frequencies as our dependence on technology increases. 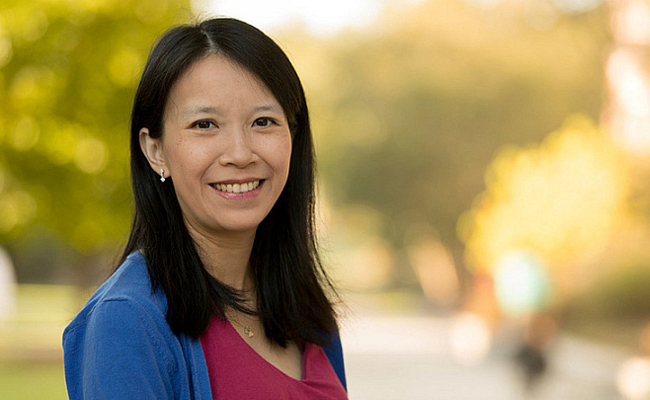 Associate professor of engineering Mable Fok, recipient of a National Science Foundation CAREER Award, is using photonics to figure out how to maximize these resources. RF photonics is the science of using light to process radio frequency signals. Normally when we have a signal, we use a computer or some other electronic component to process it. But it’s getting harder. For example, when we look at movies on our phone, we don’t want any buffering—we want things to be fast. There’s lots of information coming in, and electronics cannot really deal with it. RF photonics is more capable of simultaneously processing a lot of information using light. How is your work with the glass knifefish connected to your work in photonics? That particular fish lives in the deep ocean where there’s no light. They can’t see, so they sense their environment by sending out an electric field and receiving it back. Distortion in the electric field tells them if there’s a rock they need to swim around, or if there’s something dangerous they need to avoid, and it also helps them communicate with other fish. When two of these fish run into each other, what if they’re using a very similar frequency and can’t tell which signal is theirs? They would be confused, which could be dangerous. But when two of these fish emit a similar signal in the same area, the frequency—how fast it’s oscillating—will always repel the other. If the frequencies are too close, they will automatically move away from each other. It’s not really color, but for example, if the first fish uses a red color signal, and the second fish is also using a red color signal, one will move to orange or yellow so they can distinguish each other. How can photonics help with limitations on the radio frequency spectrum? Neuroscientists know how the glass knifefish adjusts its frequency to avoid jamming. We want to borrow that neural algorithm and add it to our communication system to allow for more flexibility in how our resources are used. Right now we have the Federal Communications Commission to tell us what frequency to use for your phone, what frequency to use for a GPS system, what frequency to use for a drone, so everything is organized. But we’re not always on the phone, so at certain times those resources are not being used. If we can allocate the resources on demand, based on availability, then more people can use them. What other uses do you see for light? Recently we’ve been looking at using fiber optics sensors for soft robotics. Normally our concept of robots is rigid. They don’t really stretch. Over the last couple of years, people have been using soft materials to make robots safer around humans and to perform tasks that traditional rigid robots can’t do. Fiber optics can also be safer in certain environments. If you’re using electronics and hold a wire in a thunderstorm, you probably will get struck. If you’re using an optical fiber, it’s glass, so you won’t get struck. It is immune to electromagnetic interference and any kind of electricity, sparks or lightning. You can use it inside an MRI machine. Glass fiber is soft, and it’s very flexible, but it cannot be stretched at all so we’ve played around with the architecture. I was inspired by two things—one is the toy my kid was playing with, the Slinky. The other is the DNA structure, which is also spiral. If we put a sensor in a spiral structure, we can easily stretch it, and it’s very reliable. What would most people be surprised to learn about light? When I was in grad school, my sister asked me how she should describe my work to her friends. At the time I was measuring things from a laser, and I told her, “I’m doing things that are so small that you can’t really see them. It’s as small as dust.” When I was a postdoc, my adviser pointed out that we don’t work on visible light like red, orange or blue—we work on invisible light. Sometimes we work on pulses so tiny that even the equipment cannot see it. These days I tell my sister that we work on something very small, even invisible, but it has a lot of applications that you’re using every day—for example, the internet. We don’t have fiber optics cable to a house, but the backbone under the ocean uses laser, it’s invisible light. You can’t see it, but you’re using it every day.